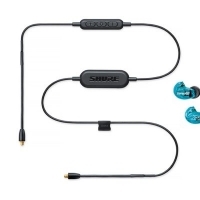 Shure today announced the launch of its first ever Bluetooth-compatible earphones, bringing wireless connectivity to its SE headphone lineup. Both the new SE112 and the SE215 models are designed to connect to an iPhone using Bluetooth. Shure says that both models feature high-quality, detailed sound that Shure headphones are known for, with a sound isolating design that blocks up to 37dB of outside noise, and a fit kit featuring a variety of sleeves for the best possible fit for each user. The headphones each offer eight hours of battery life on a single charge and have a range of 30 feet. Shure's SE215 Earphones, priced at $150, come with a detachable Bluetooth Accessory Cable, an accessory that Shure is also selling on a standalone basis for $99. The cable can be used to add wireless connectivity to current Shure SE earphones. The SE215 is available in translucent black, translucent blue, white, and clear. Shure's more affordable SE112, priced at $100, does not include the detachable cable, instead offering only a fixed Bluetooth cable. This model is also only available in black. The new wireless SE112 and SE215 will be available from retailers that offer Shure products soon.